Diablo View Orchid Society Repeats! 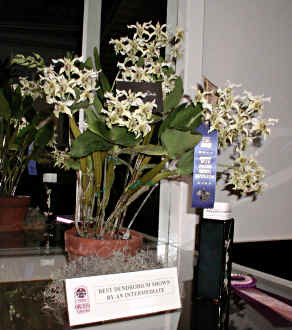 For the second time the Diablo View Orchid Society took top honors for its display at the annual Pacific Orchid Exposition. The event is put on by the San Francisco Orchid Society and arguably it is the largest orchid show and sale on the West Coast. We have taken top honors 4 out of the last 6 years… but who’s counting? Winning the category for ‘Best Exhibit by a Visiting Society’ brings an award of $1000 for our society’s coffers. We won the trophy for ‘Best Exhibit Illustrating the Show Theme’. And we won the prestigious Orchid Digest Trophy, awarded to a society or individual’s display demonstrating the best orchid variety and quality. 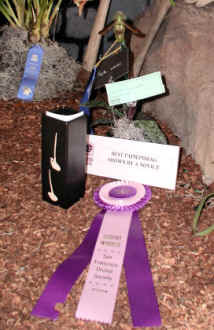 This year the POE Show Theme was ‘Orchids: Gems of Nature’. 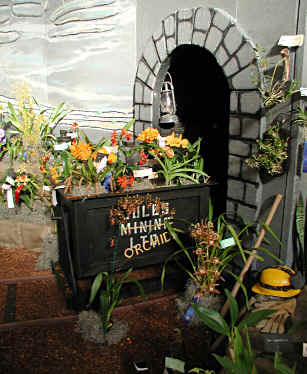 Our display featured two mining cars filled to overflowing with orchids freshly ‘mined’ from a cavernous orchid vault laced with twinkling orchid gems. The backdrop for the cars on tracks was a rock-face with a rich vein of gems cutting through it. Parky Parkison conceived the display. The mining cars he built (single-handedly) could actually roll on the tracks and be tilted at any angle to display their wealth of orchid contents. Alice Tomassini and Juan Bofill got pictures of geologic strata for inspiration for the backdrop. Alice even found rocks at a local quarry for coloring and pattern models. So armed the display crew took up the challenge of creating a rock wall out of 4x8 sheets of Styrofoam insulation. Led by Ron Bettancourt, Brenda Aday, Kathy Barrett, Veronica Bettancourt, Juan Bofill, Linda Daraskavich, Nancy Pak, Parky Parkison, and Dave Tomassini whacked, hacked, filed, gouged, drilled, rasped, glued, mudded, painted and stained the backdrop. (Remember? I told you this one was complicated!) Then they got to disassemble the whole thing in order to store it, transport it, and reassemble it at the Fort Mason Center. Thank goodness Dave has a truck and a van! Alice changed hats to artfully group our orchids into the display. Of course I arrived too late to help with the install at all. When I asked where the Diablo View crew was, the answer I got was ‘You mean that group that partied all day? They left an hour ago.’ Man! I missed out on a good time!! But enough about the ‘hard’ work. On to the rewards! 24 - 1st Place Blue Ribbons. 9 - 3rd Place White Ribbons. Will we see your plants next year?